It’s been quite the month around here! I’ve been really contemplating this blog and where I want it to go now that I’m back at work and don’t have as much time at home. One thing I know: I love writing and I love this blog so I don’t want it to become something on the back burner. I’m going to try my best to get onto a better schedule. Forgive my absence and bear with me as I continue to transition into this working momma role. It’s amazing to me how long it’s taking me to get to a “normal” place in this new role I find myself in. Of course starting a new job has made it even more difficult for life to feel “normal” because my transition in a new job has also had it’s challenges. Anyways, more on all that later! I promised a list of goals in my last post and I’m about to make good on that promise. Office : Our office is the bane of my existence! The thought of the disorganization and clutter in that room drives me batty, but it also overwhelms me to the point of paralyzing me. This year I will conquer and finish that room if it kills me! I’ve already cleared out the closet and organized it. Next up is the filing. Monthly Dates : Carlos and I hadn’t been on a date since before Ezekiel was born! Now that I’m back to work and life is busier than ever and finances are a bit more stable we are making it a point to go on one date a month. That might mean staying home and watching a movie. It’s more about the intentional act of spending time together just us. Marriage needs to be a priority, and this year we are making it that way. Home Binder : This will be our finances, cleaning and maintenance, warranties and other things. Just another way to organize our lives. Gluten Free : After going back to work in November I let my diet go and eating gluten again has wreaked havoc on how I’ve been feeling. So I’m making it a point to maintain a gluten free diet to allow my physical body to thrive. No Credit Card Debt : while on maternity leave I was forced to use my credit cards for various things and was never able to pay them down. This year I will pay them off and leave them locked up and put away to use only for emergencies. I’m already over half way to this goal! I’m excited to thrive financially this year. Past Years Picture Books : for years I’ve had pictures printed and stored in a box, and pictures stored on my computer. Just sitting there, forgotten. I wanted to get those printed pictures into photo books and also create digital books for the digital pictures. Last year I found an online deal for digital photo books and bought five of them for $5 each and I finally got them made! I’m so happy to say I am all caught up on my photo documentation! 2015 Project Life : I realized last year while documenting Ezekiel’s first year of life that I really dislike digital photo books. So I’m committing this years documentation to Project Life. I have to be careful about the amount of supplies I buy. I was drawn to Project Life because it can be as extravagant or as minimalist as you like and of course I’m going for more of a minimalist look. The problem is that it’s just so tempting to buy all the cute supplies! So far I’ve almost completed January and I’m quite pleased with it! So those are the big goals for this year. 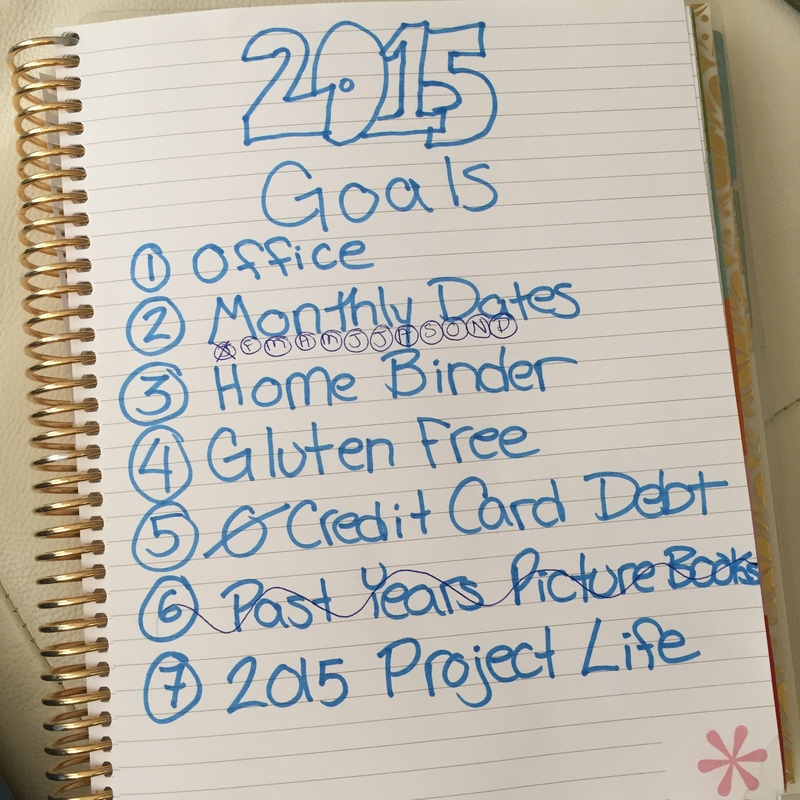 I’m confident that they are all achievable and I’m ready as ever to thrive in 2015! This entry was posted in Simplified Living and tagged DOCUMENT LIFE, GLUTEN FREE, GOALS, ONE LITTLE WORD, ORGANIZE, PROJECT LIFE, SCRAPBOOK. Bookmark the permalink.